More and more people nowadays are looking for alternatives to the traditional fluoride mouthwash. Many of the most commonly used mouthwashes are made with alcohol and other non-desirable synthetic ingredients that have people turning to natural remedies for oral care. Fortunately, there are plenty of all-natural solutions for keeping your teeth and gums clean. The best types of all-natural mouthwashes are made with one key ingredient: oil. That’s right. Oil. Many essential oils out there have anti-bacterial properties that make them perfect for aiding in not only healthier teeth, but healthier gums as well. The anti-bacterial properties of essential oils mean they can kill the bacteria in your mouth responsible for enamel erosion, plaque build-up, and gum irritation. Furthermore, many researchers believe that the oils keep bacteria from sticking to the walls of your mouth and teeth. This helps in treating bad breath and dry mouth. By ridding the mouth of this harmful bacteria, your gums are also protected against disease, since gum irritation can lead to infection, which can cause bleeding, swelling, and eventual deterioration. Your teeth are also protected since the prevention of plaque buildup that results from oil pulling reduces your risk of cavities and decay. The prevention of plaque buildup indirectly aids in tooth enamel remineralization. When your mouth is free of harmful bacteria, your enamel has the chance to remineralize, meaning your teeth are strengthened and protected. How do I use oils as mouthwash? The process of using essential oils as mouthwash is called “oil pulling.” The practice began thousands of years ago in Ancient India. The term was coined because you basically pull the oil between your teeth and around your mouth (what most of us think of as swishing). All you have to do is take a tablespoon of oil and swish it around your mouth for at least 10 to 15 minutes per day. Take care not to ingest the oil—spit it out and rinse thoroughly. Sesame oil—this is the traditional type of oil used for oil pulling. It is not only good for your oral health, but its high levels of the antioxidants sesamol, sesamin, and sesamolin help balance your physical health as well. 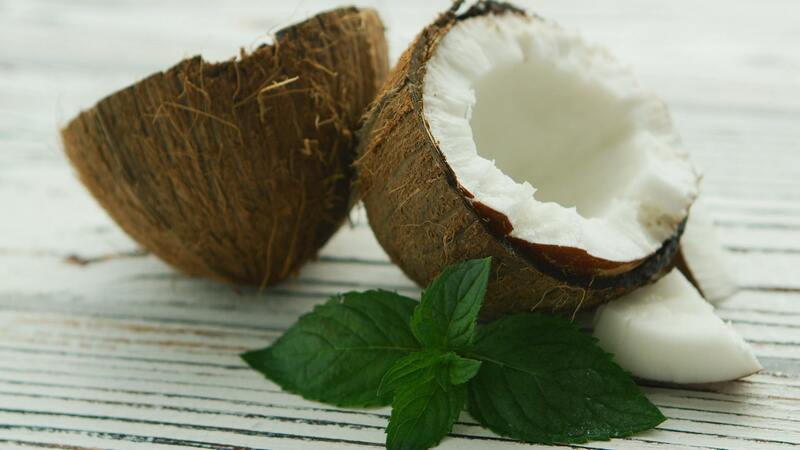 Coconut oil—this is now the most popular oil used for oil pulling, mainly because it has a much better taste than sesame oil. However, scientists have also found that the antibacterial properties in coconut oil are stronger than sesame oil, meaning it may give you better results. Sunflower oil—although not as popular as the first two oils listed, researchers have been studying the effects of sunflower oil on oral health and found that its antibacterial properties are just as strong. If adding these essential oils, all you need is one or two drops. Make sure you store your leftover mouthwash in a tightly sealed container away from direct sunlight. So this article may seem a little daunting as you have to create your own products to get the oral care benefits from oil pulling. Instead, try the alkaline mouthwash we created with coconut oil and mint essential oil. With Alka-White, you can fight off the acidity that is eroding your enamel every day!